There was never any doubt that Australia would win the team pursuit. The world record holders were more than two seconds faster than anyone else in the field. Britain was the only squad to get near the Aussies in the qualifying round and looked set for silver. But it all went wrong in the next round. 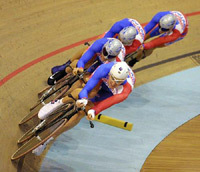 Bradley Wiggins, Bryan Steel, Steve Cummings and Chris Newton were on course for a place in the final when Newton dropped out with over a kilometre to go. His three surviving team-mates were about to catch Holland when Cummings completed his turn and failed to latch onto the back of the string. A 10 length gap opened and precious time was lost while Steel and Wiggins waited and reorganised. The trio finished together but knew they had blown it. Despite their troubles, the team still clocked 4-03.886. But Germany went just 85 hundredths of a second faster and booked a final place against Australia. The British camp then had to recover their composure and salvage a bronze. After checking the time splits, the coaches decided to drop Cummings and bring in Manning. Manning, who was recovering from a viral infection, had not ridden any of the rounds and was spectating in the stands. He was brought into the centre and had a brief warm-up on rollers before taking to the track. The squad then showed its resilience by roaring to their fastest time of the series and winning the bronze from last year's champion Ukraine. Australia had no problems against Germany, winning in 4-00.362, just 0.779 seconds outside their world record. Pursuit coach Simon Jones was clearly disappointed with the British riders after their flawed ride but quickly regained his composure. Jones was not afraid to tell the truth, explaining the string of consequential mistakes, but was also optimistic for the future: "In team pursuiting there's a fine line between success and failure. We rode what we felt was the best team in the vital second ride but I think we tried that bit too hard. We should have been a bit more confident in our own ability. We should have followed our plan to ride just under a 4-04, I think we could have done it quite easily but we didn't do that." Jones honourably says 'we' but it was the riders who messed up in the semi-final, seemingly ignoring the planned schedule and then panicking as things went wrong. "I think Chris Newton misjudged the laps. He did a really big turn and then pulled out, which is something you should never really do, you should always try and get back on. Then Steve Cummings did a turn and changed for four expecting Newton to still be on. We were just catching the Dutch team at that point and so Bradley Wiggins put in a big, big surge to get them, which again is a bit of a mistake, and so Steve couldn't get back on. At that point the damage was done but fortunately the riders got it back together and finished in a decent time. "Unfortunately it cost us a place in the final but we'll learn from the mistake and we've got to think about the future, not dwell on the past. We still up there in the top three. We had higher goals but we're still pretty close to the Australians and they're the ones who set the pace in pursuiting. We're still learning lessons and trying to establish consistency in our results but were getting there. I'm relieved and fairly happy." Bradley Wiggins was relieved the team put things back together to win the bronze medal but was furious after the mess of the semi-final. "You don't really expect things like that to happen to you, when the team falls apart, at least I don't. When I'm on fire I like everybody else to be on fire or else I get angry. I wasn't angry with the other riders, just with the situation,' he said, much more focused and mature after a year under the influence of Marc Madiot at the fdjeux.com professional team. "Fortunately we sorted things out to get the bronze. That was a really good team effort. Everybody did their bit and we pulled together as a team. After the disaster of the ride in the semi-final, I think we showed great character to come back. It's great to be part of this team when it's like that. It shows we can pull together and do a ride after a messing up before. "I'm happy for everybody involved in this team, the riders have done some great rides but it wouldn't be possible without the coaches and the staff. Having such a good World Championships with all the success, and personally knowing we can do better in the pursuiting events, sets you up for a great following year. Our confidence has gone through the roof and we're already fired up for 2003." Round one, Ukraine 4-04.638 bt France 4-07.615, Germany 4-03.801 bt Colombia 4-10.384, GB 4-03.886 caught Holland, Australia 4-00.628 caught Russia. bt Germany (C. Bach, G. Fulst, S. Siedler, J. Lehmann) 4-07.384.